PRISMs to Power the UK. : Parliamentarian: A buffoon or jester who entertains by jokes, antics, and tricks in a circus, play, the Houses of Parliament, or other presentation. Parliamentarian: A buffoon or jester who entertains by jokes, antics, and tricks in a circus, play, the Houses of Parliament, or other presentation. "...it is worrying that DECC does not have any contingency plans in place for the event that little or no new nuclear is forthcoming. Crossing one’s fingers is not an adequate or responsible approach when the UK’s legally binding climate change commitments and energy security are at stake. For a department whose principal priorities are to ensure energy security and carbon reductions, DECC appears to be overly reliant on aspiration and hope. While we share the Minister’s hope that new build will be delivered as planned, we nevertheless recommend that DECC begins exploring contingency options as a matter of urgency..."
Climate Change Commitments - A Joke! What difference would it make to the outcome, if the UK did not generate another single kilogram of carbon dioxide? - Not one Jot! But what a good way to collect votes, if you give every interested party a bit of what they want. It may mean another 4 or 5 years in a job. 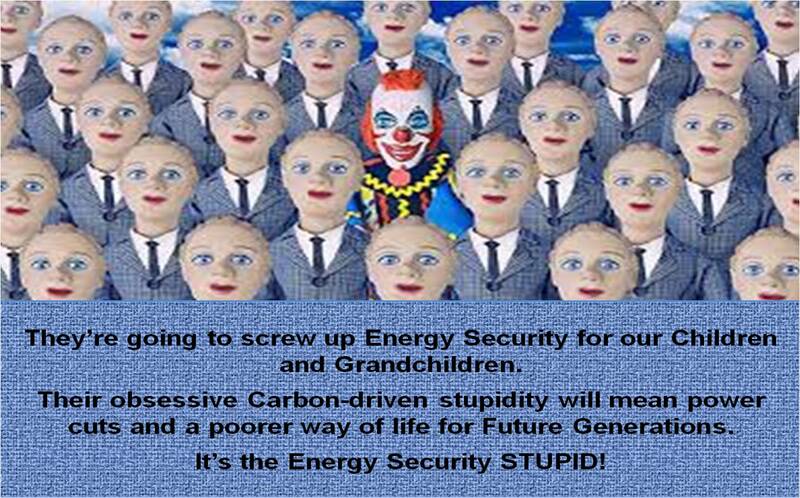 IT'S THE ENERGY SECURITY STUPID!